The official UFC 213: Nunes vs. Shevchenko 2 fight poster was released on Friday. UFC 213 is the fight juggernaut’s centerpiece, which features several high profile fights. 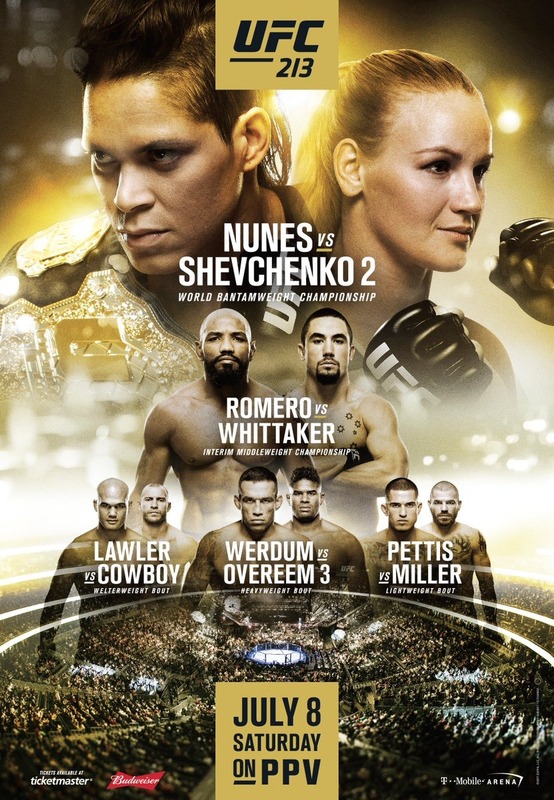 The fight card is headlined by Amanda Nunes putting her women’s bantamweight title on the line against Valentina Shevchenko, but there is little drop-off as Yoel Romero squares off with Robert Whittaker for the interim middleweight belt in the uFC 213 co-main event. Other bouts include Robbie Lawler vs. Donald Cerrone, Fabrício Werdum vs. Alistair Overeem, and many others. Check out the UFC 213: Nunes vs. Shevchenko 2 fight card here. Follow @MMAHotSauce on Twitter and Facebook. Also follow MMAWeekly.com on Facebook, Twitter, and Instagram.